It's early afternoon and we are going to share the train to Nuremburg with lots of what I judge to be junior high students - ages 14 to 16 is my guess. They all got off on the first few stops. 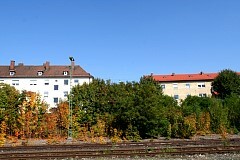 The first German railway ran between Nuremberg and nearby Fürth and was opened in 1835. 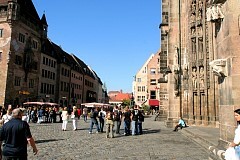 The population of Nuremberg today is about a half a million. Travel from city to city in Germany is very easy. The German train system experience is clean, safe, and on schedule. I had trouble figuring out which platform to be to go in the direction I wanted. I would usually ask someone after I got there, and more often than not would have to switch. 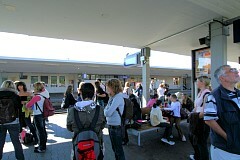 In Munich, there were three platforms, one seemed to be for regional trains. Of course, my relatives handle the correct-platform-choosing duties today. 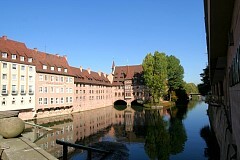 Nuremberg (German: Nürnberg) is a city in the German state of Bavaria, in the administrative region of Middle Franconia. 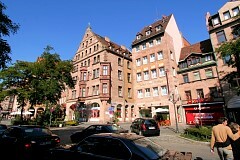 It is situated on the Pegnitz river and the Rhine-Main-Danube Canal and is Franconia's largest city. Nuremberg is not situated near a big river or the sea, yet despite its geographical location on the route from Italy to Northern Europe made it one of the most important crafting and trading towns in medieval times. 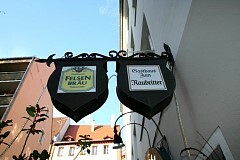 The cultural flowering of Nuremberg in the fifteenth and sixteenth centuries made it the center of the German Renaissance. In 1525, Nuremberg accepted the Protestant Reformation, and in 1532, the religious Peace of Nuremberg, by which the Lutherans gained important concessions, was signed there. As ecstatic as Nuremberg's cultural heyday was, its downfall was all the more tragic. Repeated outbreaks of the plague and the adoption of Martin Luther's Reformation alienated the Royal Family from what was their favorite city for 500 years. In 1632 during the Thirty Years' War, the Imperial general Albrecht von Wallenstein besieged King Gustavus Adolphus of Sweden in the Siege of Nuremberg. Nuremberg continued to decline, with up to 40,000 of its citizens perishing because of starvation and other effects of the conflict. The next formative period in the region was initiated by Napoleon. After defeating Prussia and Austria in 1806, he rewarded his ally Bavaria by annexing Bamberg, Würzburg, Ansbach and Nuremberg to its territory. 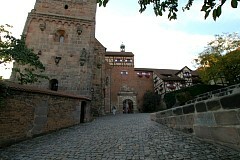 Nuremberg, which had once been the foremost imperial city, was reduced in status to a mere province. For the Franconians, this was a heavy blow, and the fact that they had to forsake their civic privileges for Bavarian State law was a difficult adjustment. 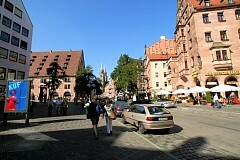 Nuremberg held great significance during the Nazi Germany period. Because of the city's relevance to the Holy Roman Empire and its position in the center of Germany, the Nazi Party chose the city to be the site of huge Nazi Party conventions - the Nuremberg rallies. The rallies were held annually from 1927 to 1938 in Nuremberg. After Hitler's rise to power in 1933 the Nuremberg rallies became huge state propaganda events, a center of anti-Semitism and other Nazi ideals. 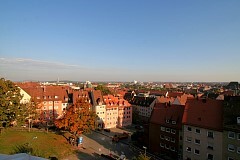 Thirty-eight air attacks on Nuremberg in the Second World War destroyed 90% of the historical buildings and 40% of the whole city and made Nuremberg one of the most badly damaged cities in Germany. In total, about 6,000 Nuremberg residents are estimated to have been killed in air raids. 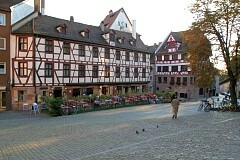 Despite this, the city was rebuilt after the war and was to some extent, restored to its pre-war appearance including the reconstruction of some of its medieval buildings. This is our approximate path through the city. South of the city is the district called Lorenz. North of the river we will walk through the area named Sebald. 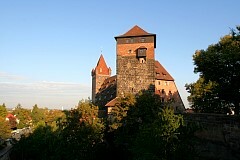 One the heights above the city is Nuremberg Castle. We arrived at Nuremberg's Hauptbahnhof (main station). 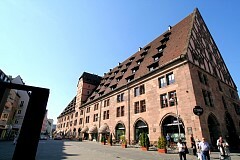 Nuremberg main station is located across the road from one of the gates in the old city walls, Königstor (King's Gate). The original city of Nuremberg was established inside a defensive stone wall guarded by 46 fortified towers, surrounded by a moat filled with water and then another outside wall. 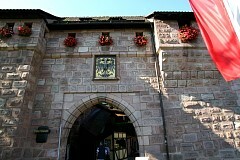 There were five main gates into the city, four of which are still standing, including the Königstor. 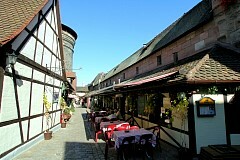 Behind the gate in are area the Handwerkerhof are located many small medieval-looking craft shops. As we walk along the street going from the train station to the old city center, buildings rebuilt after the World War II bombings are evident. Rebuilding took place with as much as the original materials as possible. A decision was made not to try and reproduce what was pulverized but rebuild in a manner that clearly shows what is wholly replacement and what is original. This is one huge building - I like all the rooms poking out from the roof. 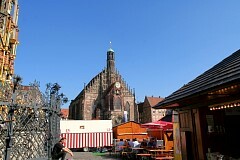 In Lorenzer Platz in Nuremberg stands the twin-towered High Gothic church of St Lawrence (St-Lorenzkirche; 13th-15th century; Protestant), the city's largest church. 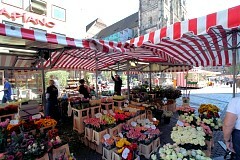 A flower stall in Market Square. 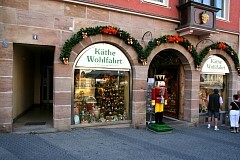 Nuremberg for many people is still associated with its traditional gingerbread (Lebkuchen) products, sausages, and handmade toys. 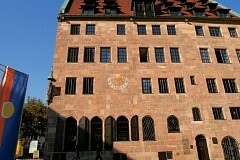 The first pocket watches - Nuremberg eggs - were made here in the sixteenth century. The Christkindlesmarkt or Christmas Market has been held in the heart of the city for over 400 years. This is just a store along the way featuring Christmas goods. The Lorenz area is separated from the Sebald to the north by the river Pegnitz and encircled to the south by the city walls. We are crossing on the so-called Museumsbrucke (Museum Bridge) - even though there are no museums nearby. The interesting building with the arches is Heiling Geist Spital, Holy Spirit Hospital, founded in 1332 and expanded in 1488-1527. The Pegnitz River canal connects the Main and Danube Rivers together. 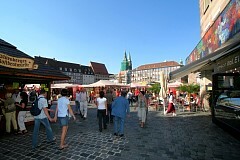 The Haptmarkt is the main market square of medieval Nuremberg. It has a sinister beginning. 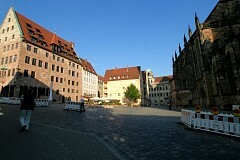 Jews originally settled this area of Nuremberg. In 1349 Emperor Karl IV made it known that he would not oppose the towns plans to rid themselves of the debts owed to Jewish moneylenders. 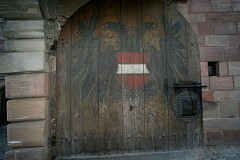 Following the example of Swiss and French towns, the Jews were first blamed for the plague then menacing the town. Local Jews were forced into their homes, the doors cemented shut, and then the whole ghetto set on fire. This eliminated both the Jews and the debts Karl IV owned them, and cleared the way for the creation of this market square. 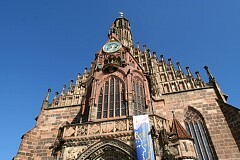 In the Haptmarkt is the elaborate Frauenkirche Gothic church. 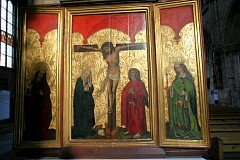 It was donated by the already mentioned Karl IV, perhaps to atone for his complicity in murdering the Jews of Nuremberg. The church's facade comprises the clockwork mechanism called a Mannleinlaufen (after the creator of the same name). At mid-day every day the clock strikes and seven statues of princes (called Electors because they vote for emperor) dance around emperor Charles IV, accompanied by the music of a glockenspiel. Also in the Haptmarkt is Nuremberg's Gothic Schöner Brunnen (Beautiful Fountain) which was erected around 1385 but subsequently replaced 100 years ago with a replica (the original fountain is kept in the Germanisches Nationalmuseum). It is 62 feet high with 40 colorful statues of biblical figures, philosophers, artists, and politicians. There is also a Golden Ring, a seamless copper ring inside the fencing that brings good luck if you turn it. I don't remember if this is where we stopped for something to eat or just a restaurant along the way. I was treated to early wine and Nuremberg's most famous food roasted sausages - they are similar to American breakfast sausage links. Our order was a dozen and came on a heart-shaped iron plate. The roasted sausages are filled with spices such as caraway seeds and thyme and most manufacturers also put in a touch of garlic! 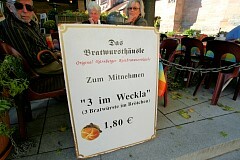 If you are in a hurry then order '3 im Weckla', which simply means 'three in bread roll'. Early wine is wine served before it's fully fermented, and gives an indication of how good the wine from that particular year will be. A sun dial on the side of this building shows the time of day we visited. Strictly speaking, this isn't an oriel window. A gothic oriel window projects from the side of a building but the jutting window supports don't touch the ground. St. Sebaldus Church (St. Sebald) is located at the Albrecht-Dürer-Platz, in front of the old city hall. 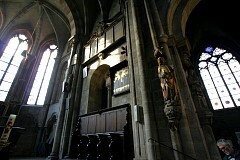 It takes its name from Sebaldus, a 8th century hermit and missionary and patron saint of Nuremberg. 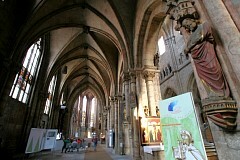 It's style is Romanesque and contains relics of the saint. Sebaldus is a Protestant church. It is plain compared to Catholic cathedrals, but for some reason I found it atheistically pleasing. 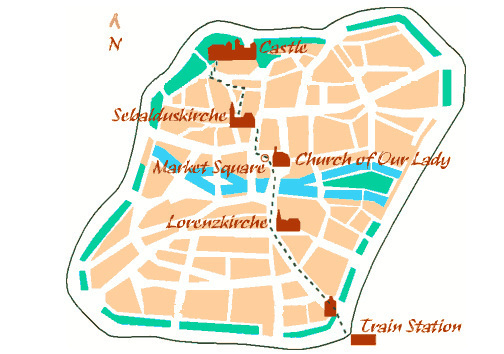 On the map we are at Sebalduskirche and will now walk north to the castle. Joseph (l) and the writer (r)- 2nd cousins. 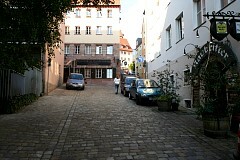 Most of the streets are narrow and crooked, and the majority of the houses have their gables turned towards the street . The general type of architecture is Gothic, but the rich details, which are lavished with especial freedom in the interior courts, are usually borrowed from the Renaissance . Most of the private dwellings date from the 16th century, and there are practically none of earlier date than the 15th century . A praiseworthy desire to maintain the picturesqueness of the town has led most of the builders of new houses to imitate the lofty peaked gables, oriel windows and red-tiled roofs of the older dwellings . Altogether Nuremberg presents a faithful picture of a prosperous town of three hundred years ago. 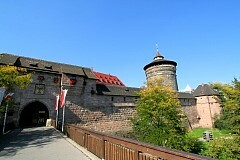 Nuremberg Castle (above, in a picture borrowed from the Internet) is comprised of three parts (left to right): the Kaiserburg (Emperor's Castle), the oldest and mostly ruined buildings of the rulers of Nuremberg called the Burggrafenveste (Count's Castle) in the middle, and the Stadtburg (part belonging to the Imperial City) on the right. All are reached following a steep climb up Burgstrasse hill. The Holy Roman Empire of the German Nation had no permanent capital, so the emperor moved from castle to castle, Nuremburg Castle being one of the stops. The castle was damaged in the Second World War but then reconstructed. From 1424 to 1796 Nuremberg was one of the three so called "Kaiserstädte" (Emperor cities). 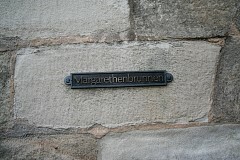 Every new king was elected in Frankfort and crowned in Aachen. These cities were called "Kaiserstädte" (Emperor cities), but the Kaiser himself was proclaimed in Rome by the pope. In the Emperor cities only the king was crowned. Nuremberg was the third Emperor city, the repository of the so called "Reichskleinodien", a collection of several holy things, which were very important for ceremonies in the German Empire. From 1485 to 1796 the Imperial crown jewels were kept in the Church of the Holy Ghost in the castle. This is the "Margaret Fountain". Any good castle has an inner water supply so the defenders can withstand a siege. There are several deep water wells through the sandstone to the aquifer below. In later years water for the Beautiful Fountain in the town below was piped there via wooden pipes from water in the castle wells. 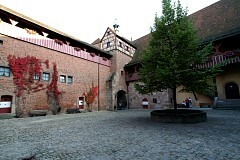 The courtyard in the Kaiserburg. 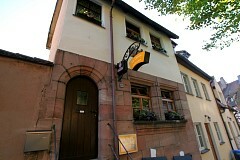 The Burggrafenveste's Sinwell tower's base is the sandstone of Burgstrasse hill. The view back towards the Old City. It's late afternoon. My attempt at an "artsy" photo. 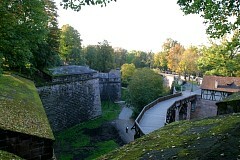 An end-on view of the Stadtburg. 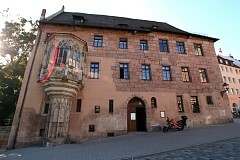 Now parts of it are used as a youth hostel. In 1381, the robber baron Eppelein von Gailingen famously escaped death on the gallows when his horse leapt from the castle into the castle moat. 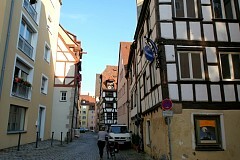 Like the tiny marriage house in Amberg, here is another in Nuremburg. To join the guild, one had to be a home owner. This tiny home was built, and then sold for the same price to a succession of men wanting to join the town guilds. Today it's a (tiny) hotel. An interesting building with outside cafe. Josef and Christal walked me back to the train station and put me on the train back to Munich.